The photo is not from Saravana Bhavan. In Chennai, very few restaurant chains are debated so much. Lots of Chennaites, think this place is crap, a whole bunch of others swear by this place. But in the preceding week, three incidents happened and in two of them, I had to have lunch here. First. My friend who came down from the US was telling me that his and his wife's families wanted to go out for dinner to a 'nice place' and I casually asked him where they were going and the answer was Saravana Bhavan. WHAT? People go to Saravana Bhavan for a nice family get-together dinner? Really? Second, we had a business meeting and three people flew down from Bombay. Two of them landed first and the the third guy landed after 3 hours. 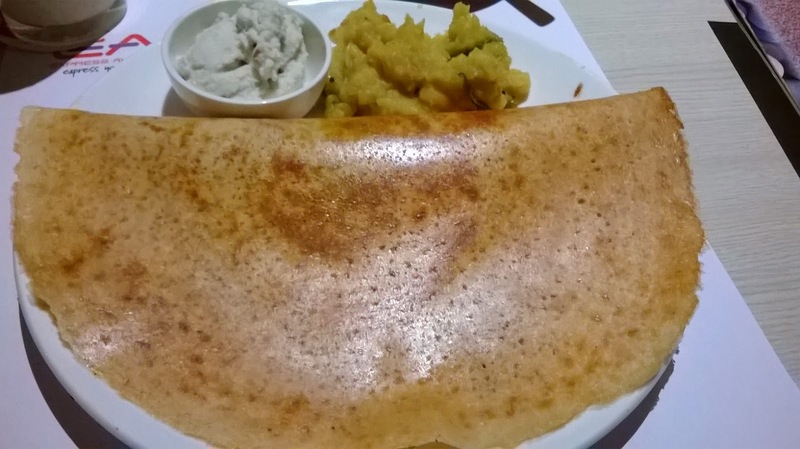 The first two were reasonably adamant that they wanted to eat 'Only at Saravana Bhavan. ' While we were having lunch there, the third guy calls and when we asked him if we can get him some sandwich or something to eat, he immediate reply was - 'I am in Chennai guys, why will I eat a sandwich? Please get me dosa and idly from Saravana Bhavan'. Three. Ditto. One guy came from Bombay and wanted to eat only there, so my colleague took him there. He came back two weeks later (last week) and asked for packed lunch from Saravana Bhavan. And I had to eat that, too. But if you look at most online food forums based out of Chennai, almost everybody complains that HSB is way to pricy. So, when I had the dosa and idly onsite, I thought they were quite nice. Quite pricy, yes, but quite nice. The packed lunch was meh, but the guy said, 'Doc, you must eat the lunch at the restaurant. It is way better.' I don't know how much better, sambar rice, curd rice, lemon rice with a pickle can get, but that's the way it is. I mean, if South Indian families are going there for a 'nice' dinner, well......speechless. Service at the A/C restaurants are a little more cultured, whereas in the non A/C areas, they are doing you a favour by serving you. They are giving you the privilege to pay them and taste their food. Bottom line, it serves very good dosa and idly, I am biased with variety rice and 'Chinese' in HSB, so my opinion does not count, but well, I won't eat those there unless I don't have an option. At times, I have had chaat there and it is OK. The badam halwa is excellent. But, I don't think I can ever review this chain properly. For that matter, I don't think I can review any 'multi-cuisine' food chains properly! Is there anybody who has done justice writing about this place? I really want to learn.